Partly cloudy early followed by cloudy skies overnight. Low around 50F. Winds W at 5 to 10 mph.. Partly cloudy early followed by cloudy skies overnight. Low around 50F. Winds W at 5 to 10 mph. 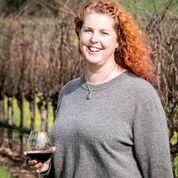 SAN LUIS OBISPO— The San Luis Obispo Wine Country Association (SLO Wine) has hired Anne Steinhauer as its new executive director. Steinhauer comes to SLO Wine from the Napa Valley, where she ran 6539 Consulting. In that capacity, she was the consulting executive director of the Napa Valley Cannabis Association. She previously conducted community relations for the Napa Open Space District and was the interim executive director for the Napa Valley Coalition of Nonprofit Agencies. Her prior experience includes positions in the U.S. House of Representatives, Napa Valley Vintners and Napa County Red Cross. She holds a Master of Arts degree in International Policy from the Monterey Institute of International Studies and a Bachelor of Arts Degree in Anthropology from UC Santa Cruz.